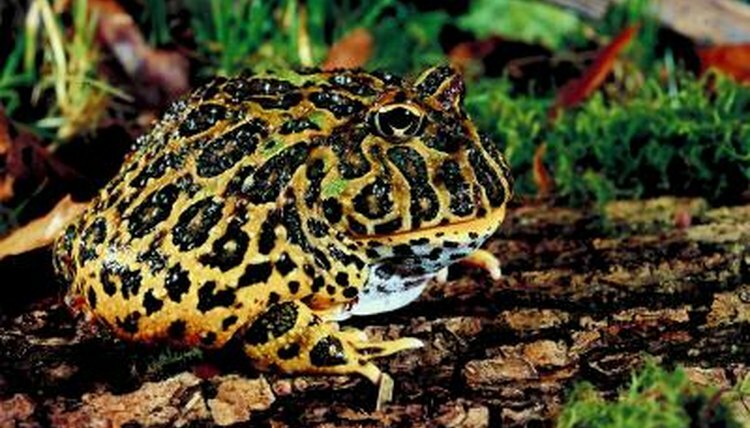 Also known as horned frogs, Pacman frogs make good first-time amphibian pets due to their hardiness and ease of care. Sedentary and rotund, with disproportionately large mouths that take up most of their heads, it's no wonder these horned frogs earned their nickname after the video game character. Depending upon their diet, Pacman frogs may exhibit astonishingly rapid growth rates. Before breeding, captive Pacman frogs need a little help getting "in the mood." First, a cool, dry spell lasting a couple of months must be created within the frog's environment, followed by a moist, rainy season. Rain is made by using misters inside the cage or a spray bottle. Within a few days of the onset of the rain, Pacman frogs will lay up to 1,000 eggs. Once laid, those eggs hatch into tadpoles within two to three days. Pacman tadpoles are highly carnivorous and don't make good aquarium mates, because they tend to snack on each other. When keeping Pacman tadpoles in a community habitat, you will need a large assortment of real or synthetic plants to provide plenty of hiding places for the tadpoles, which will help prevent them from cannibalizing each other. Some prefer to group the tadpoles by size, but they grow so quickly that, if you plan to do this, you will need to sort them at least once per day. The final option is to house each tadpole in his own cup. Within three to five weeks, the tadpoles will begin their metamorphosis into little froglets. Once the tadpoles grow legs and absorb the tail, they can eat food suitable for a juvenile frog, which usually includes crickets, goldfish, a variety of worms, pinky mice and even your fingers, if you aren't careful. Growing Pacman frogs are voracious eaters and will consume nearly anything put in front of them, much like Pac-Man gobbling up all the dots, ghosts and fruit in the video game. They aren't picky, but you shouldn't feed them anything too large, since oversized prey presents a choking hazard and, unlike Pac-Man, they don't get three lives to finish their meal. Depending upon the variety of frog you have, Pacman frogs can grow up to 6 or 7 inches, usually as big around as they are long. Frogs fed a protein-dense diet may reach their full size within a year or so, while those fed more moderate diets such as crickets and worms may take three to four years to reach their adult size. Very much a look but don't touch type of pet, Pacman frogs have a reputation for being grumpy and don't like human handling. Not only is the Pacman frog susceptible to illness or injury, he is the only frog with teeth, and is quick to bite. Pacman frogs are sedentary, burrowing into the substrate and lying in wait to ambush prey, much like Pac-Man lurking in the corners of the video screen, waiting patiently to ambush the unsuspecting ghost.